Hackfall Wood - an historic landscape - descriptions from the 18th and 19th Centuries. Hackfall is a beautiful landscape open to all. Where did the name come from? There are currently two competing theories which, in light of new research, may just be a load of old Victorian twaddle. 1. It is thought that the Victorians, keen to sell trips to a mystical garden suggested that the name Hack Fall derived from “Hag Vale” or in other words valley of the witches. Whilst there is clearly a valley there is no evidence of it being inhabited by witches at any time in its history. 2. Later academics have made the assumption that “Hack” is derived from “hook” and point to a hook or bend in the river to explain this. This smacks of having no real evidence and trying to make something fit. In fact if you look far enough back into ancient documents you can find reference to a name which has a clear lineage to “Hackfall”. In the Chartulary of Fountains Abbey the monks recorded a land transaction for “Haggenridyng” which is associated with Thorp Malesar (Grewelthorpe) and Notewyth (Nutwith). GRANT by William son of William de Plumton, knt., for the health of lord Roger de Moubray and for the health of his soul, to Walter the thatcher (cooperatori), Roger de Fetherby, William son of Eva, John son of Walter, Richard the carpenter, of Thorp Malesar’, and all the commonalty of the said vill, free men and others, of all that land with pasture in Notewyth and in Haggenridyng which he had by the gift of the said lord Roger de Moubrey, with all the appurtenances; to hold to them, their heirs and assigns, and all the commonalty of the said vill, from the grantor, his heirs and assigns, in common pasture for ever, freely, etc., with free entry and exit and all easements, etc. ; to use the said pasture for feeding, or otherwise to their profit, as they wish, at all hours and times of the year, without hindrance from him, his heirs or assigns ; for which land and pasture the said men and the commonalty were accustomed to render him sixteen shillings of silver yearly for herbage. Rendering thence yearly to him, his heirs or assigns, one penny at Easter by the hand of the said Walter the thatcher or his heirs or assigns, for the whole commonalty of the said vill, for all customs, exactions, suits of Court or secular demands. Warranty. Sigillum. Test., Dom. Alan de Aldefeld, Dom. Ralph de Midelton, Robert de Beltoft, Nigel de Aldefeld, Gocelin de Brathut, Adam Russel, Herway de Clyfton, and others. The Roger de Moubray in question was son of William de Moubray and was born before 1230 in Thirsk (Hovingham) and died in 1266. This is confirmed by a later entry in the Chartulary which is a confirmation by Roger de Mubray (They keep changing the spelling) son of William de Mubray and is dated 1255. We can therefore place this transaction, including Haggenridyng to approximately 1250. “Haggen” is old English/Norse to chop or hack. Definition and is therefore a direct link to the word “Hack”. “ridyng” is riding and this was the spelling used by Chaucer. 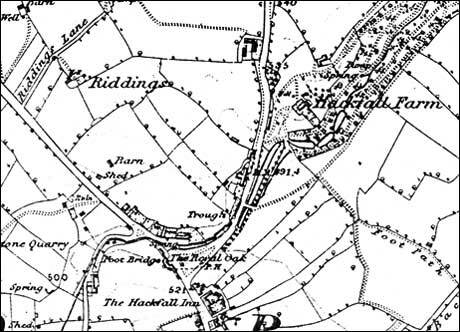 Interestingly there is an area very close to Hackfall on the 1856 OS 6 inch map called “Riddings”. There is also a later reference to Hek hed which is associated with Nutwith. This could be “Hek hed or Hak hed”. The modern use would be Hack or Heck head. In an audit of the value of the standing timber in the time of Christopher Beckwith this field is called “Ockehedd” also “Callid Ockhedd” This is clearly not a wood but has x (10) okes and (vxxiij) young okes. There is therefore a very clear lineage for the word Hack used in “Hackfall” and there is no need to make up stories about witches or look for hooks in the river in the hope that some one might have used it as inspiration for a name. There is therefore little doubt that Hack comes from “Haggen”, an Old English/Norse word associated with tree felling which was used in “Haggenridyng” as a broad term for an area between Grewelthorpe and Nutwith in 1250. Fall could be derived from the same root as vale or valley or may refer to a water fall in earlier wetter (believe it or not) times, or from a description of the edge which surrounds much of the wood. Take your pick. I favour it being derived from the same Old English/Norse root as vale. There may be some resistance to this theory from Hackfall academics who have previously failed to spot the obvious. Faced with the evidence above I don’t think that they have a leg to stand on.